*Akatsuki Daydreams*: Study Tip: Color Me Smarter!!! Sometimes I can be easily distracted or I can get bored fast when I am trying to do my school work. Every once and awhile I swear I am a 3 year old trapped in a 19 year old's body. A Bad Example: I am writing a paper for my English class. I need to find a specific passage to back up my thesis. I have marked, in blue ink, all over my book with notes I made to myself while reading the book. Also, in the same ink, are notes about the book I needed to know while discussing it in class. I need to find only what I did in class because what I thought before discussion was a little off. For my paper I need to be absolutely correct. Sadly, after awhile I get bored and frustrated trying to decipher which blue notes are old (pre-class notes) and which are new (during class notes). I just settle on a few hard facts from the book and do the best I can. A Worse Example: I am trying to study for a midterm and I am going over a specific cluster of rules that my professor stressed over and over again. It is in my notes and I see them. But oh crap...they are all starting to run together. Everything looks the same in dull gray pencil. (Couldn't take notes with a computer because he won't let me. He's one of those professors. 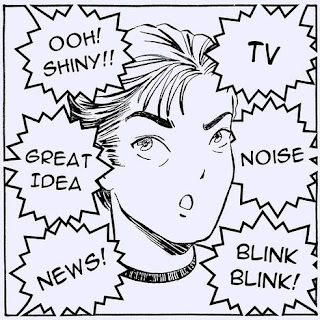 You know... anti-technology = anti-distraction) I get bored and watch Detective Conan instead. The Worst Example: I am diligently doing my homework in my study spot on campus and then - distraction. Someone walks by with a pair of really cute cerulean blue wedges with a bow that sparkles. Shoes, Pretty Colors, and Sparkles: Three of my biggest weaknesses. I become inspired to browse the internet for similar shoes, or worse I get in my car and go looking for similar shoes. These situations happened alllll the time to me from the beginning of Freshman year until Spring Semester of Sophomore year. I had seen a girl in one of my entrepreneurship classes using them and I loved how pretty they were and the neat box they came in. So I bought them as soon as I saw them. Aesthetically, these things are really cool. 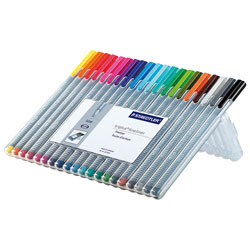 The package comes in 10 colors, all in a curved, triangular shaped marker. The markers come in a clear case with a spot for each marker. It is relatively small and can be easily carried around in a bookbag or purse. The case can be opened all the way so the markers are completely exposed or partially opened for just the top. The best part about the case is you can fold the top part to have the markers propped up at an upward angle for the easiest, fastest access. Pretty colors + Easy study tool Mobility + Useful packaging = Happy Me. And I can not believe how I became so much more productive using just fine tip markers. I mentally tricked myself into finding note taking, reading, and studying more interesting than it actually is. colors and organize them through color coding." Finding key passages in books became easier. - I would mark important words and phrases with a different color instead of similar colored pencil. Determining which was my notes and which was the more correct note about what I read became faster. - One color = at home and The other color = In class. It was that simple. Even complex and annoying Japanese grammar rules became easier. to do was find the matching color I assigned to the grammar form. This would take three seconds as opposed to the three minutes of searching my notes. make your visual attraction/distraction work for You. Do you need to remember a tricky fact for a test? Write it down in a different color from your other notes. Make it stand out. Trying to keep organized? Color code your notes. For different topics, whip out a different marker. Come test time all you need is to make your "red pile" or "blue pile" and organization is done! 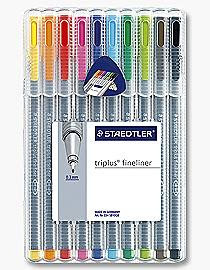 Staedtler even has a 20 marker package...I'll get this big guy only if I really need it. Maybe these markers cannot stop you from being distracted by really cute shoes, but they can help you be more organized and give you a bit more focus. Create your own helpful, visual distractions and take control of your focus. Add color, find things faster, retain more information, get better grades. You can do it!!! Do you use colored markers to help you study? 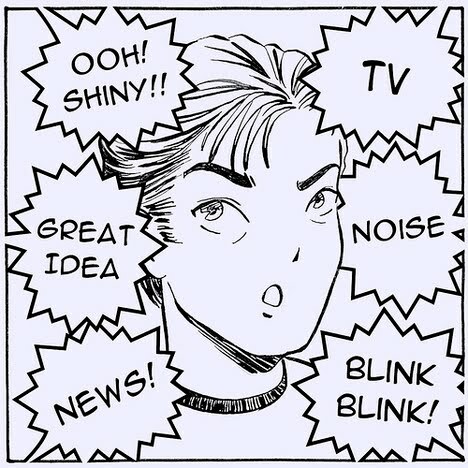 What do you do to stay focused in grueling classes? Let me know!! !